"Our goal at Senapa Cards is to offer more than outstanding invitations and event accessories. We want to inspire you. We want to partner with you in the planning of your celebration." At Senapa Cards, we love celebrations (especially weddings). Honest, we do. It shows in the care that we take to ensure that your interaction with us is not only pleasant, but enjoyable. We're based in "The Great Lakes State" of Michigan with additional distribution centers in Montana, Minnesota and Alberta, Canada. This gives us the unique opportunity to offer two-day ground shipping to most locations within the U.S. and Canada. Senapa Cards was born out of our love for celebrations and penchant for inspiring others visually. We not only offer some of the most gorgeous invitations, favors, gifts and decor, but loads of inspiration to go along with them. 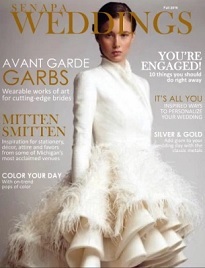 Take our wedding magazine. The visual and editorial quality of Senapa Weddings is top-notch and its pages are inspirational. The magazine's style is elegant and sparkling, simple and contemporary, and creates an inviting world that has something for all couples preparing to wed.
We do all that we do because we want your celebration to be a total success. Our customers appreciate this and start their celebrations via our award-winning invitations. They end with us by bestowing our festive favors and thank-you cards to show gratitude to their guests. If ever you need us, we're just a phone call or email message away. We're always delighted to hear from you and happy to help in any way we can. Ready to embark on what could be the most enjoyable leg of your event-planning journey? Welcome to Senapa Cards - An A+ Rated BBB Accredited Business.